With Easter fast approaching, my thoughts have turned towards festive baking and what could be more Easter-y than Hot Cross Buns. Every year seem to make a new variety – I was particularly pleased with the flavour combination of last years sticky toffee ones (actually i really must make some of them before the weekend!) and chocolate chip varieties of anything go down well in this household. But by and large Easter baking means spice – hot cross buns, easter biscuits and simnel cake all have a mellow spice that is the taste of sweet easter baking (if you remove chocolate from the equation!). This hot cross buns variation leaves out the dried fruit (to please my kids) but ramps up the spice and adds the mellow sweetness of vanilla. It’s s great combination and I do recommend taking the time to make these for Easter – they’re so rewarding and fun to make. I posted my recipe for chocolate chip hot cross buns last week, but toffee/fudge flavoured hot cross buns seem to be a big thing this year. I’ve noticed varieties in Waitrose and Marks and Spencer – it really must be the bang on trend flavour of 2016. Never one to miss an opportunity to play with new and exciting flavours, I thought I’d experiment myself with these toffee ones. Now, I haven’t eaten one of the commercial buns, as you can imagine there is no room or need to buy such items in our household, so this is entirely my take on the idea. I’ve combined the flavours of sticky toffee pudding with hot cross buns and what a cracker of a combination it is. The mellow sweetness of the date purée and subtle spices do work. The purée also gives a rich colour to the dough, enhancing the whole ‘sticky toffee’ look and feel. The dramatic shiny glaze is simply a thin coating of warmed golden syrup and the buns are then returned to the oven for a few minutes, giving the perfect sticky, shiny top. I’ve hardly ever seen a baked item disappear with such speed, they were requested for breakfast, snack and puddings, working perfectly slightly toasted with a smidgen of dairy-free margarine and an extra drizzle of syrup for added sticky toffee naughtiness! I’d think I can safely say these are our new family favourite Easter treat! Add the dates to 1 cup of dairy-free milk and simmer for 5-10 minutes, until dates are soft. Blitz, stir in the bicarb and set aside to cool. This should make approximately 1 cup of date purée. Knock back, knead again and then form into 12 even sized balls (for a professional look, weigh them to make them all the same size). Place well spaced on a baking sheet lined with grease proof paper. Loosely cover with cling film and leave to rise for a further 30 minutes or so. Make the glaze by warming the syrup. Brush over the hot buns. Return to the oven for 5 minutes. 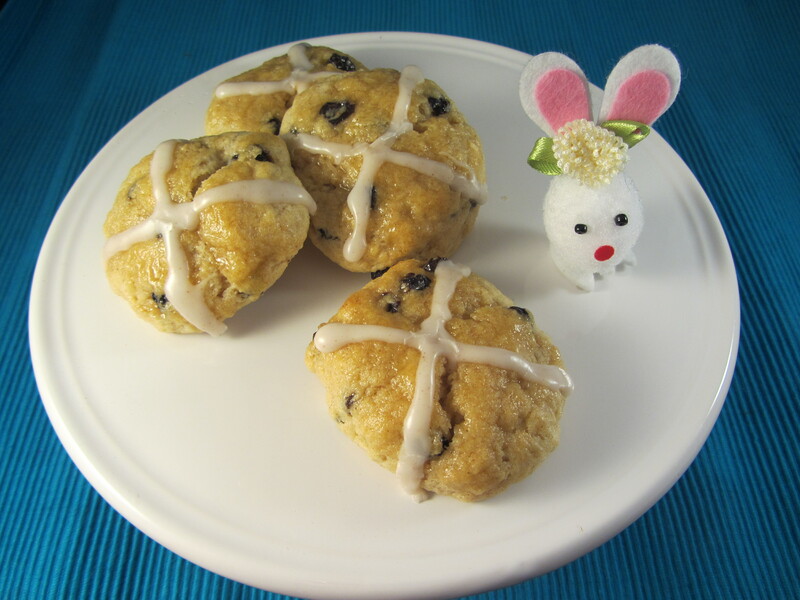 Having posted about Hot Cross Buns last year, I thought I’d spice things up with a new idea. 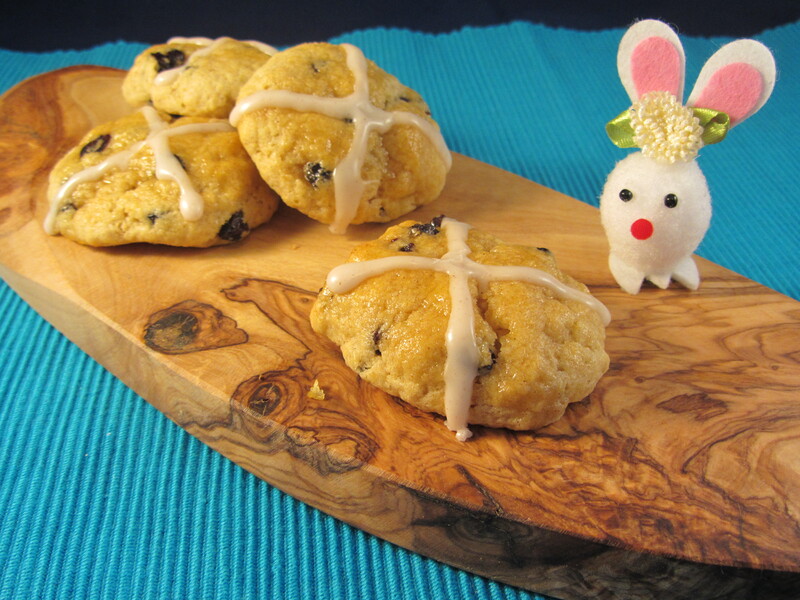 The warm flavours of hot cross buns easily translate to other sweet treats and I especially love making cookies: so thats how we got to Hot Cross Bun Cookies this year! Soft and delicately spiced, pepped up with currants and finished off with a cinnamon flavoured icing cross, these cookies shout out Easter. I brushed the tops with nappage (thinned, hot apricot jam) to give the authentic shiny, sticky top, but by all means leave out this step if you wish. Hot Cross Bun Cookies cookies are certainly hard to resist and make the perfect unusual treat for the Easter period and take no time to make – always an added bonus! – Bake for 15 minutes until starting to brown. – Heat the jam and water mix and bring to the boil. 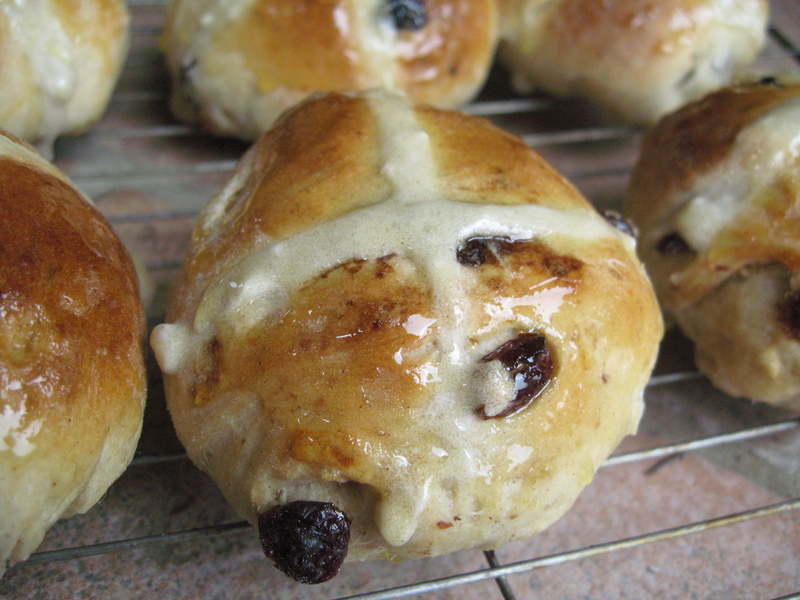 Well, it’s Good Friday so it must be the day to post Hot Cross Buns. I could have easily bought some dairy-free, egg-free low quality buns from the supermarket… but, since I’m challenging myself and the supermarket version “may have traces of sesame” I decided to make a batch. It was a bit of a palaver …. hours of rising and knocking back, but actually they worked really well and it was very satisfying having a home-made batch to hand out. It’s Little S who can’t have sesame and she really isn’t keen on currants/sultanas/raisins so they weren’t her thing… but Big S and I thought they were very authentic and rather yummy! – Sift the flour, salt and mixed spice into a bowl. Rub in the dairy-free spread with your fingertips. – Stir in the sugar, lemon zest and yeast. – Make a well in the centre and add the flax seed mix and warm oat milk. Mix well to form a soft dough. Mix in the dried fruit. – Turn out onto a floured surface and knead well, until smooth. – Place in a greased bowl, cover with a clean tea towel and let rise for an hour. – Return to the bowl, cover and let rise for a further half hour. – Turn out again and cut into 6 pieces. Roll each into a ball and flatten slightly. – Place on a greased baking tray. Cover with greaseproof and wrap in a plastic bag to keep out the air. Rest for 10 minutes. – Brush over the warmed golden syrup.